Sharing a public deck is as simple as sending out a link. 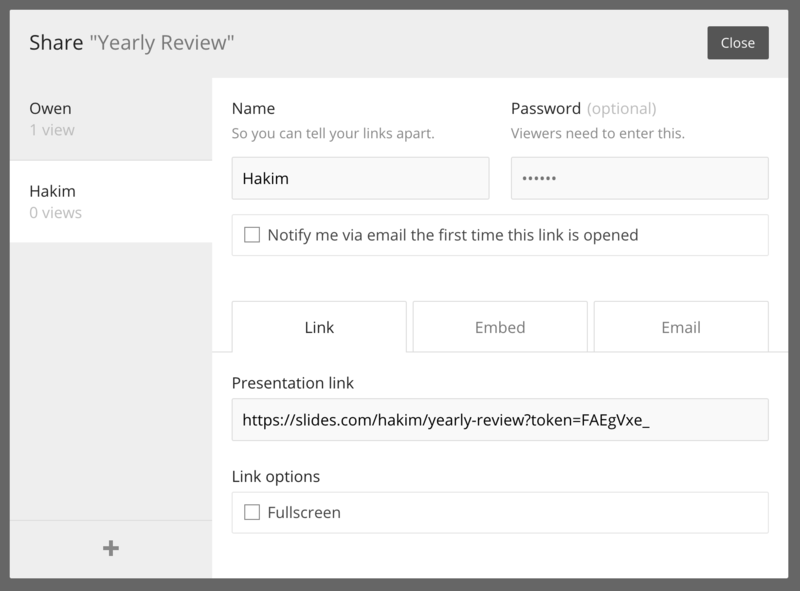 The process of sharing a private deck is similar, but you need to start by creating a private and optionally password protected link. You can create any number of these private links, name them and track how many times they have been opened. Optionally specify a password that users will have to enter before viewing your deck. Learn more. Each link has a unique view count. This makes it possible to track who has viewed your deck and how many times. You can opt in to be notified via email the first time that this private link is viewed. Links can be deleted by hovering over them in the list. Deleting a link will revoke access to it, meaning anyone you have shared it with will longer have access.